Grew Up… with a scheming “pappy.” Bret and his father hatched all kinds of tricky schemes in order to keep themselves afloat in the Wild West. Living… by his wits and gambling talents. Maverick is trying to raise $25,000 in order to enter a poker tournament with a $500,000 grand prize. With that money, he can retire happy and end his hooligan days forever. The only problem is that everyone who owes him money is trying to avoid paying him back like the plague, and a new acquaintance, named Anabelle Bransford, seems to be giving him a real run for his money. Profession… gunslinger. 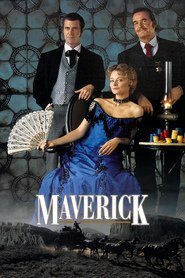 Maverick can draw a six-shooter faster than the best gunfighters around. Interests… poker. His true talents lie in reading the “tells” of fellow card players and calling them on their bluffs. But now he has to do without his lucky shirt, which Anabelle intentionally shrunk during a complimentary wash.
Challenge… getting the money for the poker tournament. After he tries unsuccessfully to call on old friends with debts, he must revert to more desperate measures to rustle up that cash. Personality… charming, ostentatious, calm under pressure. He’s kind of a coward, but in the most heroic way possible. He’s ready to throw down fists, but he would rather avoid a fight than get caught up in brutal violence. Bret Maverick's popularity ranking on CharacTour is #3211 out of 5,000+ characters. See our top-ranked characters and read their profiles.